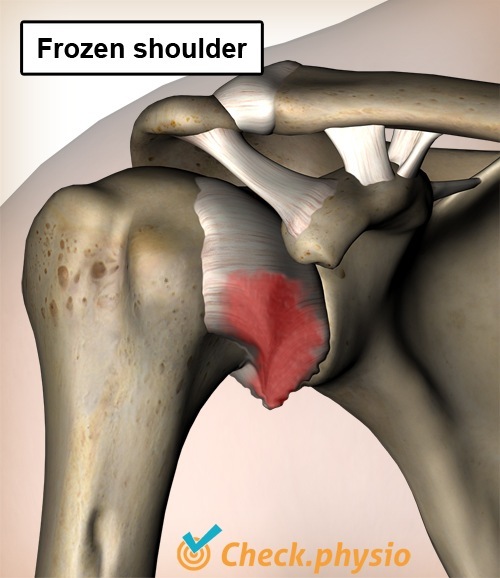 A frozen shoulder (adhesive capsulitis) is caused by an inflammation of the joint capsule of the shoulder. This can cause thickening and adhesion of the joint capsule, which can result in a painful shoulder and prolonged symptoms. The age at which most patients present with a frozen shoulder is between 40 and 60 years. It is also known that people with diabetes mellitus are affected by the condition much more frequently. 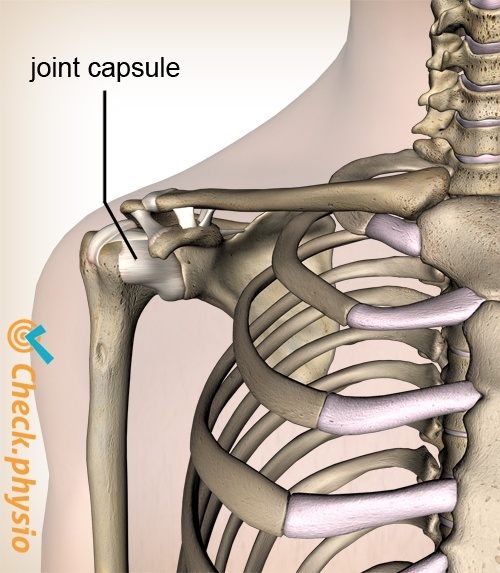 The joint capsule of the shoulder connects the socket of the shoulder blade (scapula) to the head of the upper arm (humerus). The function of the joint capsule is to limit overextending the shoulder joint and thus preventing subluxation. A frozen shoulder is the term given to adhesions and thickening in the joint capsule that makes shoulder movements stiff and painful. The inflammation in the joint capsule that can result in a frozen shoulder can occur spontaneously or as a result of trauma (accident or fall). If the inflammation occurs spontaneously we refer to this as a "primary frozen shoulder". If it occurs following trauma, we refer to it as a "secondary frozen shoulder". The symptoms develop gradually and can persist for months or even years. Eventually the symptoms gradually disappear until the patient is pain-free. The patient will often have a (slight) limitation of movement that does not improve further. Despite the prolonged nature of the condition, it is not serious and the patient will usually make a complete recovery. The pain is located on the outside of the shoulder and can radiate over the upper arm. In severe cases the pain can even be felt in the hand. In addition, a limitation of movement will also occur. In particular, the patient avoids elevation and outward rotation of the arm due to the pain. Rapid and unexpected movements of the arm can cause severe pain. The condition is divided into three phases: A "freezing" phase, a "frozen" phase and a "thawing" phase. The freezing phase lasts 2 to 9 months. This phase is accompanied by pain and increasing stiffness. The pain is often worst at night. During the frozen phase, lasting 4 to 12 months, the stiffness remains. However, the pain gradually decreases and is limited to the fully extended movements. During the last - thawing - phase, which can last several months to several years, the range of motion gradually increases until the patients is free of symptoms. The diagnosis is made according to the patient's history and the examination of the range of motion. X-rays usually do not reveal any abnormalities. The shoulder will eventually heal spontaneously and the stiffness will mostly disappear. The physiotherapeutic treatment is aimed at the (pain-free) active mobilisation of the shoulder and combatting the pain. If the pain is severe, a corticosteroid injection can be considered. Surgery can accelerate the recovery during the last "thawing" phase of the condition. The shrivelled capsule is manipulated under general anaesthetic.